A doctor guides small robotic arms through several tiny keyhole incisions. This allows for greater range of movement than a doctor's hand. Follow a special diet if instructed. Shower the night before using antibacterial soap if instructed. Arrange for someone to drive you home from the hospital. Also, have someone to help you at home. Keyhole incisions are placed in preparation for a robot-assisted surgical procedure. Several small keyhole openings will be cut in the skin near where the surgery will take place. 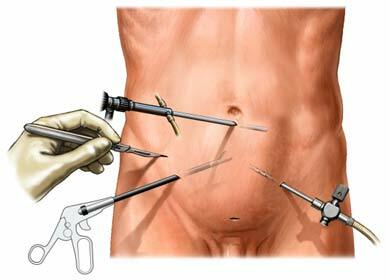 In most cases, a needle will be used to inject carbon dioxide gas into the surgical area. This gas will make it easier for the doctor to see internal structures. Next, a small camera called an endoscope will be passed through 1 of the incisions. The camera will light, magnify, and project an image of the organs onto a video screen. Then robotic arms holding instruments for grasping, cutting, dissecting, and stitching will be inserted through the holes. While sitting at a console near the operating table, the doctor will use lenses to look at a magnified 3-D image of the inside of the body. Another doctor will stay by the table to adjust the camera and tools. The robotic arms and tools will be guided by movements of the surgeon. Lastly, the tools will be removed and stitches or staples will be used to close the area. Anesthesia will prevent pain during surgery. Pain and discomfort after the procedure can be managed with medications. You may also feel discomfort from the gas used during the procedure. This can last up to 3 days. This procedure is done in a hospital setting. The usual length of stay is a few days. Your doctor may choose to keep you longer if you have any problems. Be encouraged to walk with assistance soon after surgery. Receive guidelines on what you should eat and what activities you can do. Depending on your procedure, you should be able to go back to your normal activities in a few weeks. Participate in any physical therapy or rehabilitation. Robot-assisted heart surgery. Cleveland Clinic website. Available at: https://my.clevelandclinic.org/health/treatments/17438-robotically-assisted-heart-surgery. Accessed March 27, 2018. Robotic surgery. The Robotic Surgery Center at NYU Langone Medical Center website. Available at: http://robotic-surgery.med.nyu.edu/for-patients/what-robotic-surgery. Accessed March 27, 2018. 6/2/2011 DynaMed Plus Systematic Literature Surveillance http://www.dynamed.com/topics/dmp~AN~T905141/Treatment-for-tobacco-use: Mills E, Eyawo O, Lockhart I, Kelly S, Wu P, Ebbert JO. Smoking cessation reduces postoperative complications: a systematic review and meta-analysis. Am J Med. 2011;124(2):144-154.